CAIRO (Reuters) - The last prime minister to serve under deposed Egyptian President Hosni Mubarak has been allowed to re-enter the race for the presidency, one day after electoral authorities disqualified him, the state news agency reported on Wednesday. Analysts said Ahmed Shafiq's re-entry into the race will make him the favourite of the military and a very strong contender to win Egypt's presidential elections set for May 23-24, with a run-off scheduled in June. "The presidential electoral committee headed by Farouk Soltan accepts the appeal of former Prime Minister Ahmed Shafiq, allowing him to contest the presidential race," MENA reported. Shafiq had been disqualified on Tuesday after the ruling military council approved a new law drawn up by the Islamist-dominated parliament denying political rights to anyone who served as president, vice president or prime minister in the decade prior to Mubarak's fall in February of last year. The electoral committee gave no reasons for accepting Shafiq's appeal, although some analysts said it had acted to avoid further appeals that might have delayed the elections. An ex-air force commander, Shafiq's success in the elections would extend military rule in a country that has been led by army officers since the overthrow of King Farouk in 1952. He is likely to take votes that otherwise would go to Amr Moussa, the former chief of the Arab League who is seen as an alternative for voters who do not want an Islamist head of state. 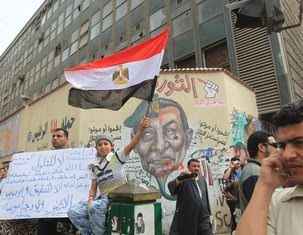 "His entry back into the race will certainly appease remnants of Mubarak's old order. It will also allow the army to breathe a sigh of relief because, of all the presidential candidates, Shafiq is the one who understands the military best," political analyst Nabil Abdel Fattah said. In an interview with Reuters in February, Shafiq said he was running because he had the experience to maintain good ties with the generals and ensure a smooth handover to civilian rule. The 71-year-old, who was civil aviation minister for a decade, said he can bridge the divisions in Egypt. The other front-runners are the Muslim Brotherhood's Mohamed Mursi and Abdel Moneim Abol Fotouh, a former member of the group. The electoral committee also decided to refer the law that had been used to disqualify Shafiq to the Supreme Constitutional Court to review its constitutionality. 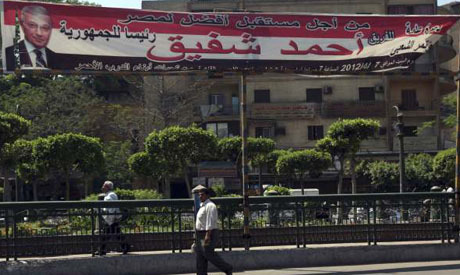 Political activist Hassan Nafaa said the electoral committee's decision was a rebuke to the Islamist parliament, which had passed the law to prevent Mubarak associates from running. "This decision is a slap in the face of parliament and shows it has rushed into passing a law that is likely to be unconstitutional," Nafaa said, adding that parliament's authority had been undermined by the decision.